Aside from being a culinary delicacy, asparagus is an excellent food to improve and maintain overall health. It is fat-free and low-calorie and can be eaten on even the strictest of diets. Asparagus contains many of the nutrients we need on a daily basis, such as potassium, fiber, thiamin, and vitamins A, B2, and B6. It is also one of the the best food sources of glutathione, a powerful antioxidant; rutin, which strengthens blood vessels and capillary walls; and vitamin K, an essential element for blood clotting. 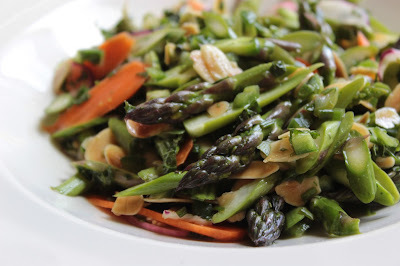 One of the most important elements in asparagus is folic acid. Folic acid is necessary for blood cell formation and growth, blood cell reproduction in the bone marrow, repair of the body, and prevention of liver disease. Folate (folic acid in food) is particularly important for women who are pregnant or planning to be. Folic acid is essential for the health of unborn babies by helping to prevent neurological defects, such as spina bifida, a birth defect of the spinal chord. (See the article entitled "Strawberries" in this category for more information on spina bifida.) Folic acid may also help prevent miscarriages and Alzheimer's Disease. A 5-ounce serving provides almost 60% of the recommended daily allowance for folacin. • Slow the progression of cataracts. According to Jean Carper in Food—Your Miracle Medicine, this is because of the glutathione, which has shown in studies to hinder cataracts. • Improve skin conditions, such as acne and rosacea, because of its substantial amount of vitamin A. • Act as a diuretic and laxative. This is useful for bloating and conditions such as dropsy (an accumulation of liquid in connective tissue). • Alleviate symptoms of kidney and bladder stones. The ancient Greeks and Romans believed that asparagus helped prevent bee stings and relieve toothaches. American Indians used dried asparagus for heart problems. Currently, there is information circulating that asparagus not only helps maintain weight but that a specific type of asparagus actively helps with weight loss. There is a diet pill now on the market made from this asparagus. Following the theory that water retention is the major cause of obesity, the manufacturers claim that their product helps the body lose excess water, resulting in weight loss. I would think eating fresh asparagus would have the same effect. 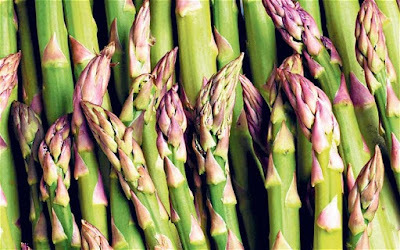 A serving of 5 spears of asparagus contains: 40 RE vitamin A; 2g protein; 5g carbohydrate; and 2g dietary fiber. Of the U.S. RDA, one serving contains: 10% Vitamin A; 10% Vitamin C; 2% Calcium; and 2% Iron. When purchasing asparagus, look for tight tips. They should be free of brown spots and mildew and the stalks should not look shriveled. Small spears are usually more tender than larger ones. Keep asparagus refrigerated and standing upright in an inch of water, or at least wrapped in damp paper towels. It will keep a few days but use it as quickly as possible. There are different kinds of asparagus but whether you buy green, white, or purple, they should all be cooked until crisp-tender (the point at which you can pierce the stalks easily with a fork but they are still firm). Do NOT cook them until mushy. Mushy asparagus is tasteless and insipid and the texture is unappealing. Believe it or not, asparagus was once a very risqué vegetable. Because of its shape, particularly white asparagus, it became a phallic symbol and women were forbidden to eat it. When Catherine de'Medici ate asparagus (she ate anything she wanted—to hell with convention! ), it caused a great scandal, but it let other women thereafter indulge in the delicious stalks. Whether because of its shape or some other invisible characteristic, asparagus has been considered an aphrodisiac in many cultures. 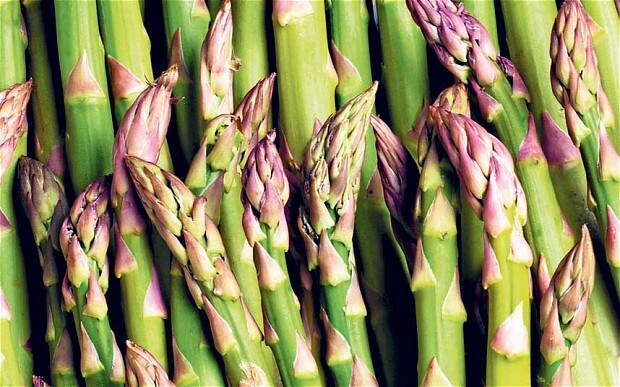 An Elizabethan writer said of asparagus that it "manifestly provoketh Venus" (i.e., it makes you hot). 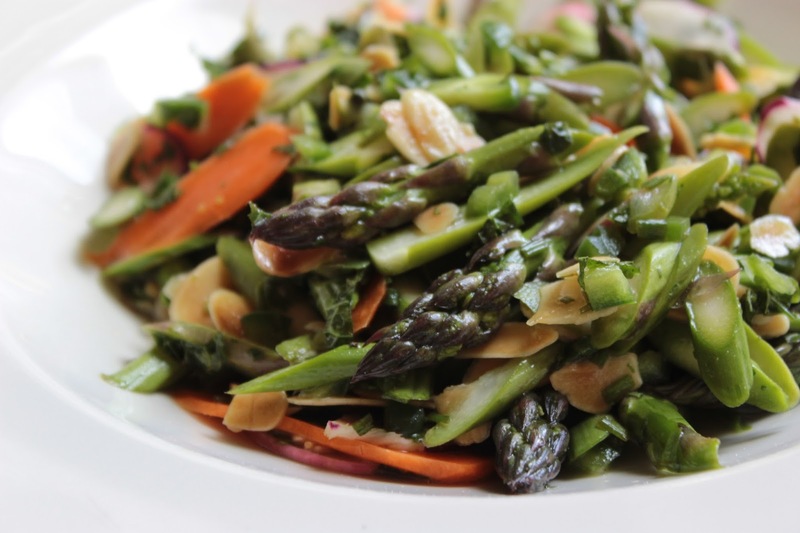 The Chinese believed that the roots of asparagus plants increased feelings of compassion and love. In modern India, asparagus is believed to increase fertility, relieve menstrual cramps, and increase milk production in nursing mothers. "The Michigan Asparagus Advisory Board" at http://www.asparagus.com. Cook fresh asparagus in boiling water 8 minutes or until crisp/tender. Cook frozen asparagus according to package directions. Drain and arrange on serving platter; keep warm. Combine remaining ingredients in small saucepan. Bring to a boil; simmer 6 minutes or until mixture thickens slightly. Pour sauce over asparagus. Serve hot. If using fresh asparagus, cook in small amount of boiling water until just tender. Drain well. Combine asparagus with remaining ingredients, stirring gently. Cover and refrigerate overnight. Stir again before serving. Put cooked Asparagus in shallow buttered baking dish. Melt 1/4 Cup butter, add 1/4 cup white wine, ½ tsp. Salt, 1/4 tsp. Pepper; pour over Asparagus and sprinkle the top with 1/3 Cup Parmesan cheese. Bake uncovered at 425 degrees for 15 min.